To celebrate the discovery of diamonds in South Africa 150 years ago, Ferdi de Vos undertook a journey on the byways of the Diamond Route of the country. His road trip companion? Toyota’s new C-HR crossover with its diamond-inspired design. On the banks of the Orange River near Hopetown, with the parked Toyota C-HR glistening diamond-blue in the Northern Cape sunshine, I pondered the event that would momentously shape the course of South African history. You see, it was in this vicinity 150 years ago where 15-year-old Erasmus Jacobs found a transparent rock on his father’s farm, De Kalk. Having no idea what this particularly shiny pebble was, he took it home for his sisters to play with. Some sources state that young Erasmus found the pebble in December 1866, others maintain that it was January 1867. Of importance, though, is that a neighbour, Schalk van Niekerk, identified the “rock” as a diamond. This “rock” would later be named “Eureka”, and weighed an impressive 22 carats. Then, in 1869, an 83.5-carat diamond, which became known as the Star of South Africa, was found nearby. This discovery – as well as diamond deposits found by the cook of a prospector named Fleetwood Rawstorne and his group of fortune hunters (the Red Cap Party) near Kimberley – sparked a diamond rush. The famous “New Rush” saw nearly 50,000 prospectors flock to the Kimberley area to seek out their fortunes. During the course of the next decade and a half, South Africa produced more diamonds than India had in the past two centuries. The rush also led to the formation of the largest man-made hole on earth, which had been dug out in the search for diamonds. This hole, with a perimeter spanning nearly 2 km, yielded roughly three tons of diamonds, and during the mining process, over 20 million tons of earth was excavated. Nowadays, it is one of the biggest tourist attractions of the Northern Cape (and, ultimately South Africa) – The Big Hole. And, after leaving Jozi earlier that morning, it was my next destination. 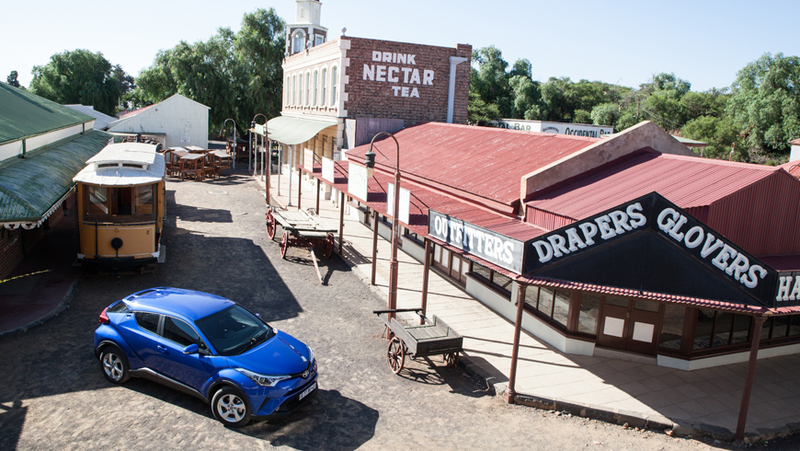 On the quite rutted tar road from Hopetown to Kimberley, I could again appreciate the link between the exterior and interior design of the brand-new Toyota C-HR. “Sensual Speed-Cross” – the new design language of Toyota, which combines a diamond architectural theme and facetted gemstone-like shapes with fluid surfaces and elegantly integrated detailing – distinguishes the C-HR from its humdrum stablemates. This distinctive styling combines powerful lower body lines and a raised ground clearance, with a slim and sleek coupe cabin profile; and – like a well-cut diamond – it creates a delicate balance of precision and sensuality. This motif is also visible on many interior parts, including switches, the door trim pattern, the headliner, and even the needles of the analogue dials in front of the driver. The design concept, which combines high-tech functionality with fashion, is reinforced by the layered architecture of the instrument panel. It continues through to the door trim with stylish ornamentation and a piano black panel. I could also appreciate the driver focussed detail – with all the operating switchgear and audio touch-screen angled slightly towards the driver seat. Speaking of which, the unique two-tiered front seat design – which combines the slender, sporting upper section with a strongly bolstered lower area – was very comfortable on the long road. By now, we were in the bustle of mid-town Kimberley, and we had to rely on the navigation system – part of the standard Multi-Information Display (our Plus model had a full-colour TFT) – to lead us to The Big Hole. Kimberley, eventually named after the then British Secretary of State for the Colonies, Lord Kimberley, was the first city in the Southern Hemisphere (and the second in the world, after Philadelphia in the USA) to have electric street lights. It also housed the first Stock Exchange in Africa, as early as 1881. Yet, the largest and capital city of the Northern Cape Province is still world-renowned for the hole that used to be the Kimberley Mine, which actually used to be a flat-top hill called Colesberg Kopje. After diamonds were found on Colesberg Kopje in 1871, thousands of prospectors descended on the hill. Within a month, 800 claims were cut into the hillock. From mid-1971 to 1914 the kopje was carved away completely. Once at The Big Hole, we headed for The Old Town; a collection of historic Kimberley buildings from the time when it was the second largest town in South Africa. These buildings have now been restored and feature shops and food outlets open to the public. Here, one of the knowledgeable guides told me that the hole is 463 metres wide and was excavated to a depth of 240 metres. Under the surface, the Kimberley Mine was mined to a depth of 1,097 metres underneath The Big Hole. Contrary to popular belief, it is not, in actual fact, the largest man-made hole on the world; the Jagersfontein Mine appears to hold this record. Having finished out photo-shoot in Kimberley, we followed the R31 over Barkly West to our destination: the Finsch diamond mine belonging to Petra Diamonds at Lime Acres. By production, this diamond mine is the second largest diamond operation in South Africa (after the De Beers’ Venetia mine). The mine, opened in 1967, has supplied over 130 million carats of diamonds in its half century life-span, and plans to produce 2 million carats per year by 2018. It is an impressive operation, but the little town of Lime Acres was even more impressive – neat as a pin and obviously well-run by the mine management. From here, it was still a 3-hour long trip to Upington, so we decided to stay on tarred roads and the N14 highway in order to make up some time. Even with only a 1.2-litre petrol engine under the bonnet, the C-HR easily kept up to speed on the long, flat stretches of tarmac. 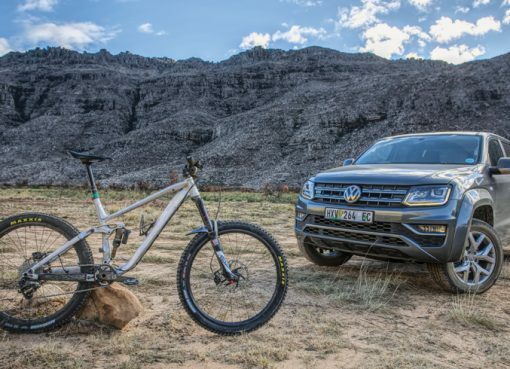 The small turbocharged unit, that delivers 85 kW and a constant torque curve of 185 Nm between 1,500 and 4,000 rpm, gains from advanced technology that allows it to change from the Otto-cycle to the Atkinson cycle under low loads. Direct fuel injection, a water-cooled turbo, and VVT-iW (Variable Valve Timing – intelligent Wide) enhances its performance and efficiency further. Even at high revs, the small mill was smooth and quiet; and, in Sport mode (normal and eco modes are also available) it was surprisingly keen. However, with the six-speed iMT (intelligent manual transmission) one needed to get used to modulating the clutch against the revs of the small engine, otherwise it bogged down. In this sense, the CVT model is probably the better option, since it automatically synchronises the gear ratios with engine speed, but I quickly became accustomed to the manual ’box. We arrived in Upington quite late, but were still cordially welcomed at River Bank Lodge, our overnight accommodation, ideally situated on the banks of the Orange River. After a hearty breakfast next to the swimming pool of the lodge the next morning, we set off again – a long stint with many rutted and dusty dirt roads en route ahead of us. Our initial plan was to visit the diamond mines in Port Nolloth and the Alexander Bay region, but we soon realised it would entail a 600 km detour, so we decided to take the R27 rather and head for Cape Town. While on the open road, we had time to take a closer look at the C-HR. Toyota maintains that it redefines the crossover segment, but the truth is that it actually was developed in response to Nissan’s Juke, which was already introduced in 2010. Why did it take so long to develop the C-HR? Well, according to the Japanese car-giant, the delay was due to a decision to wait for the Toyota New Global Architecture (TNGA) platform before the product was finalised. 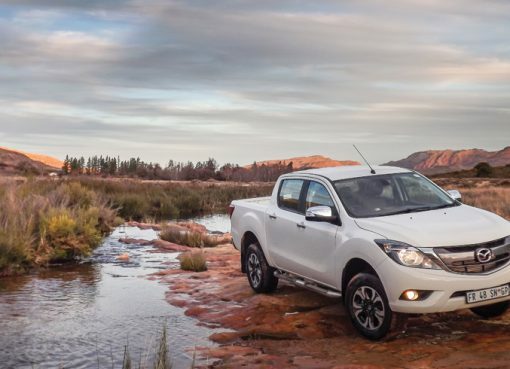 It may have given other rivals, such as the Honda HR-V, the Mazda CX-3, the Suzuki Vitara, the Peugeot 2008, and the Opel Mokka X a head start, but it was in all likelihood the correct decision. As the second model on the GA-C platform after the Prius, the C-HR does benefit from this lower centre of gravity platform, as it ensured better drivability, more balanced handling, and less body roll. Still gleaming clean, the striking styling of the C-HR was very noticeable. Its prominent headlights house LED Daytime Running Lights (DRL) in a prism shape, while the shoulder axis running from front and rear emphasise its flowing geometric design. Its coupe-like styling is enhanced by disguised rear door handles in the C-pillar and the sweeping roofline that extends into a large rear spoiler. The eye-catching design is aimed squarely at millennials, and it should find favour in this market. However, its 377 litres luggage space was limiting, yet still better than that of the Juke (354 litres), but unlike the Nissan, its rear seats cannot fold completely flat. We also found that vision to the rear is impaired due to the coupe-like styling, and the small rear side windows makes sitting in the back feel claustrophobic, while small kids might battle to reach the high rear door handles. At Brandvlei we tackled the R357, a rather challenging piece of dirt road. Here, the C-HR impressed with its good build quality and rattle-free interior. 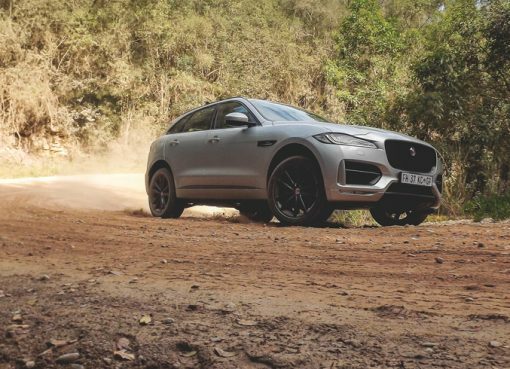 Even without four-wheel drive, the small crossover felt stable and solid on the loose gravel surface. Soon we were in Loeriesfontein, and with newfound confidence in our small steed – a real little diamond in the rough – we aimed for Nieuwoudtville and Vanrhynsdorp. In the sweeping passes after Nieuwoudtville, the C-HR showed off its sporty side. With a low centre of gravity and a specifically designed strut suspension in front, and wishbone suspension at the rear, it felt solid and planted in corners; and, even with a ride height of 160 mm, there was virtually no body roll. After an exhilarating descent down the Ouberg Pass, we were in the home straight after a more than 2,000 km trip all the way from the diamond town of Cullinan where the local launch of the C-HR took place. During the trip our average fuel consumption was 7.1 litre/100 kilometre, and not once did the small Toyota falter, even on some demanding roads not really suitable for 4×2 vehicles. Apart from millennials, the C-HR will definitely find favour with an older generation who are still young at heart. Its pricing is competitive, and it is a breath of fresh air in the Toyota line-up. It will shine like a well-cut diamond on the sales charts for sure.